3. I expected to go into the applications menu in pcmanfm and find the time I last used the program. 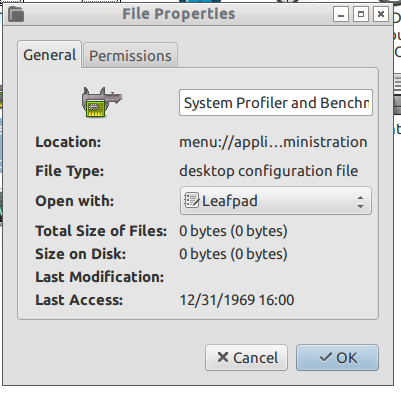 It also doesn't show the time last modified which could be the time modified by the dektop file if I changed anything could be useful to know. 4. PCmanfm shows with the right click menu no time accessed for this file and the date created as unix start time modified for my timezone. Although not sure this would be good for privacy. The upgrade to pcmanfm 1.2.0-1 seems to not have this problem on a new user I created and this was reported as fixed upstream in the pcmanfm 1.2.0 release notes.